The Simple Dressing Gown in pink and white seersucker gingham is a Cabbages & Roses staple from season to season. The shape has been taken from a traditional dressing gown. A simple belt hooks through loops and ties at the waist in a floppy bow. Patch pockets sit on the front with turn back tops. There is a neat slit up the back and the fabric falls to ankle length. Unlined, the dressing gown has a relaxed fit so that you can snuggle up in on a cosy Sunday. 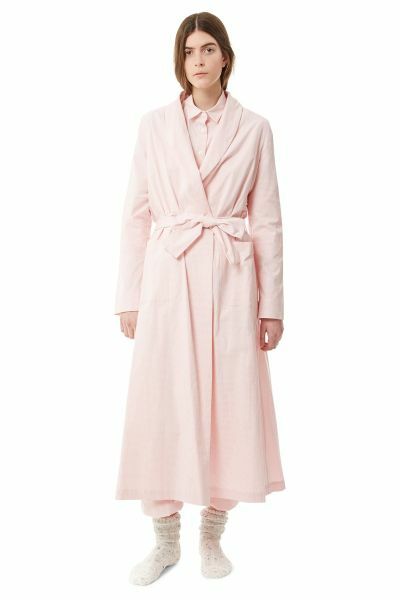 The Simple Dressing Gown is made from a sweet seersucker pink & white gingham cotton blend woven in Italy. He was made in Hertfordshire. 100% cotton. Caring for your Dressing Gown: The simple Dressing gown Can be machine washed at 30°, we recommend using Ecover Delicate Laundry Liquid. Can be dry cleaned, if you must, with an ecologically friendly dry cleaner. Press with a cool iron. Please do not bleach or tumble dry.